Two great tastes that would taste great together. 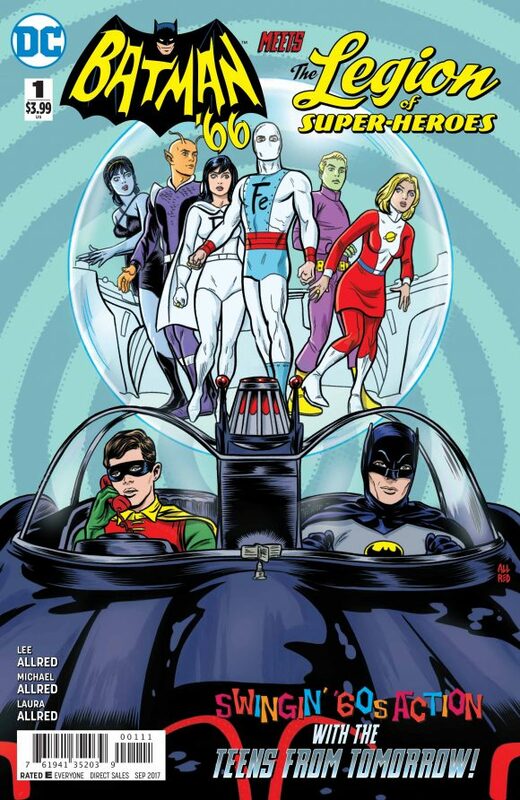 This week, the one-shot Batman ’66 Meets the Legion of Super-Heroes #1 by Team Allred hits print, marking the end of the line of Batman ’66 comics series and crossovers. I’ve been hearing persistent rumors from multiple sources for the past couple of months on two fronts: One is Batman ’66 Meets Archie, which could be coming sometime down the line. 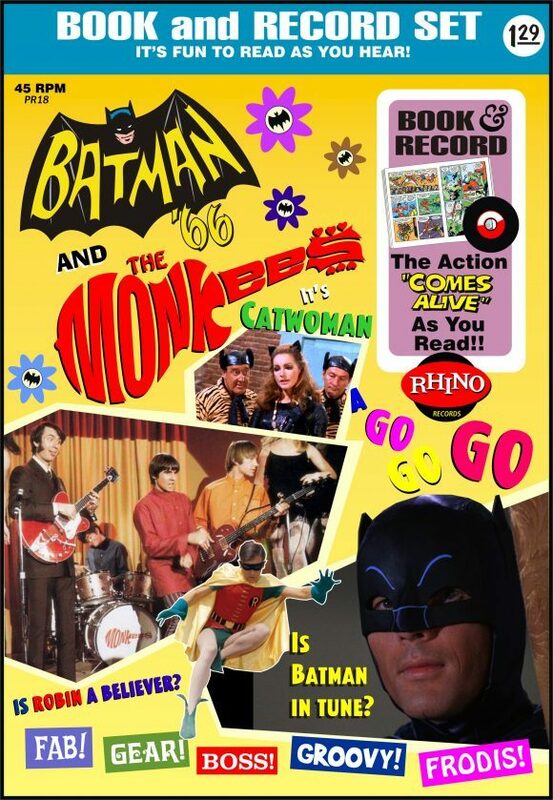 I’ve also heard there’s been internal discussion of Batman ’66 Meets the Monkees at DC and Rhino, which, fortuitously, are both in the Warner corporate family. From what I hear, though, neither are going to be announced this week at San Diego Comic-Con, which means things are progressing slowly or not at all. Of course, I could be proved wrong — and I’d be very happy if that were the case. I don’t even typically trade in rumors but I’ve gotten so much feedback about the Batman ’66 comic and readers’ hopes that it will continue that I felt compelled to share what I know. 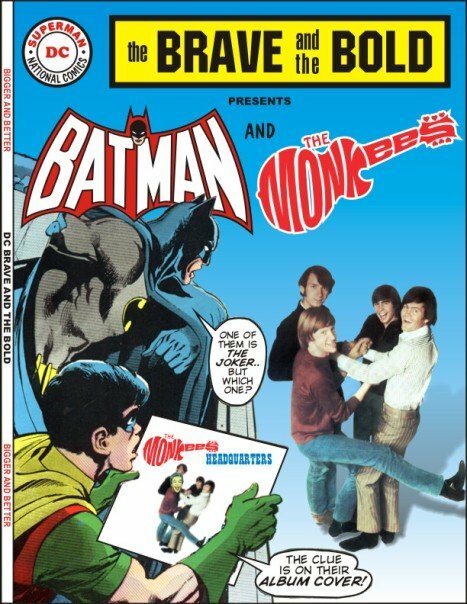 Batman ’66 Meets the Monkees, on the other hand, would press the buttons of fans like me who loved both shows when they were on in syndication at the same time in the ’70s (or, naturally, in first-run in the ’60s). That said, I think most casual fans know the Monkees’ music more than they remember individual episodes of the show, so there’s the potential for something to get lost in translation. “The Penguin and Oraculo should be among the story’s heavies. This is a matter of convenience, following a wispy thread of established continuity. 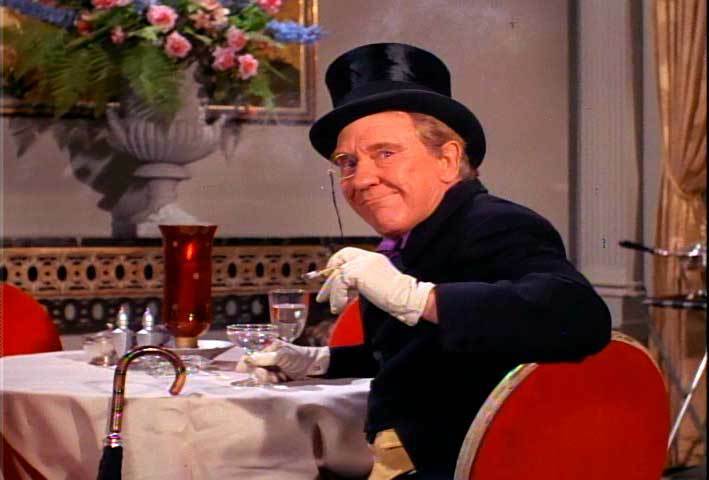 TV’s Penguin Burgess Meredith appeared — for all intents and purposes in character as the Penguin — on The Monkees, in the 1968 episode The Monkees Blow Their Minds. The Penguin didn’t participate in the plot of that episode — he just sat at a table, cackling his Penguin cackle, in a club where the mentalist Oraculo was performing. But what was he doing there? Does the Penguin know Oraculo? Is this waddling felon merely a big fan of hypnotists’ acts, or are he and Oraculo about to collaborate on something devious and diabolical? There’s a story there. Somewhere. “Batman ’66 Meets the Monkees would also need to use Catwoman, as well as her doppelganger, April Conquest, the girl with whom each of the Monkees yearned to hold hands and walk along the sand. Both roles were played on TV by Julie Newmar. The identical physical appearances of Catwoman and April could serve as a catalyst for intrigue and adventure; Catwoman has already been involved with crimes against a pop group (she stole Chad & Jeremy’s voices on a Batman two-parter), though I betcha our fickle April will wind up on the arm of Robin the Boy Wonder. “Ideally, a crossover story like this should include as much as can be used effectively from both series’ continuities. Commissioner Gordon should meet the Monkees’ landlord, Mr. Babbitt. Bruce Wayne’s butler Alfred may know Davy Jones’ grandfather from a shared youth in England. Batgirl, the Purple Flower Gang, Aunt Harriet, Milly Rudnick, the Riddler and Mr. Scratch (the Devil himself!) are all fair game. 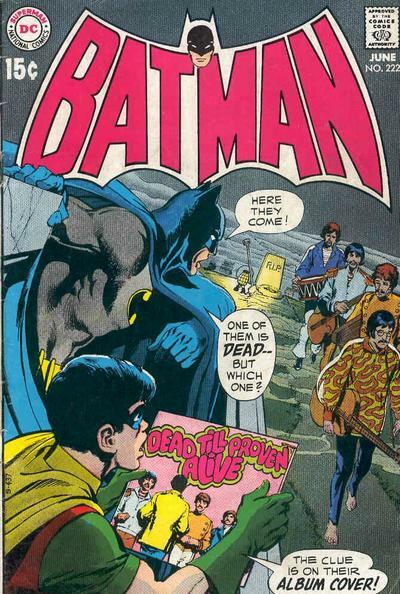 “Batman and Robin should pursue a lead that brings them to the Monkees’ West Coast milieu, and the Monkees should likewise find themselves in Gotham City pursuing stardom (or even just a job). And Bruce Wayne, in his capacity as a major stockholder in the Eden Records label, could be looking for groups to sign and possibly tour with Eden’s biggest act, British superstars the Oliver Twists. “I wanna see the Joker’s moll Susie get all starry-eyed over Davy Jones (and, of course, our Davy will tell Susie’s boss, “You must be joking!”). I wanna see the Monkeemen fight alongside the Caped Crusaders, Two-Face‘s scarred visage frightening poor Peter Tork (causing a concerned Mike Nesmith to scold Two-Face, “Don’t do that.”), and Micky Dolenz matching strategic wit and scientific invention with Mr. Freeze. 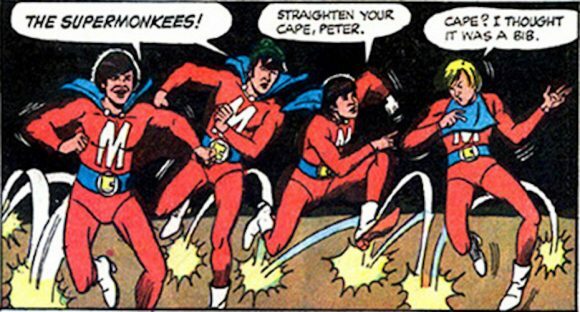 Dell’s Monkees comic in the ’60s referred to them as the Supermonkees! Ross and Mark Waid’s Kingdom Come. Either way, I’d hop the Last Train to Clarksville — or Gotham — to get my hands on this. Oh, and for other Batman ’66 crossovers we’d love to see, click here. Thanks for the plug, citizen. I have written several potential Batman ’66 stories that I would love to see published officially (although I am considering publishing online as fan art so all can enjoy) by DC Comics. Cowabunga! Begora! Three issues in to Archie Meets Batman ’66 I could see Batman Meets The Monkees. Off the top of my head I could see Glick and Louie The Lilac with the Frodis. Yeah The Joker, The Penguin and Catwoman would be there along with April.